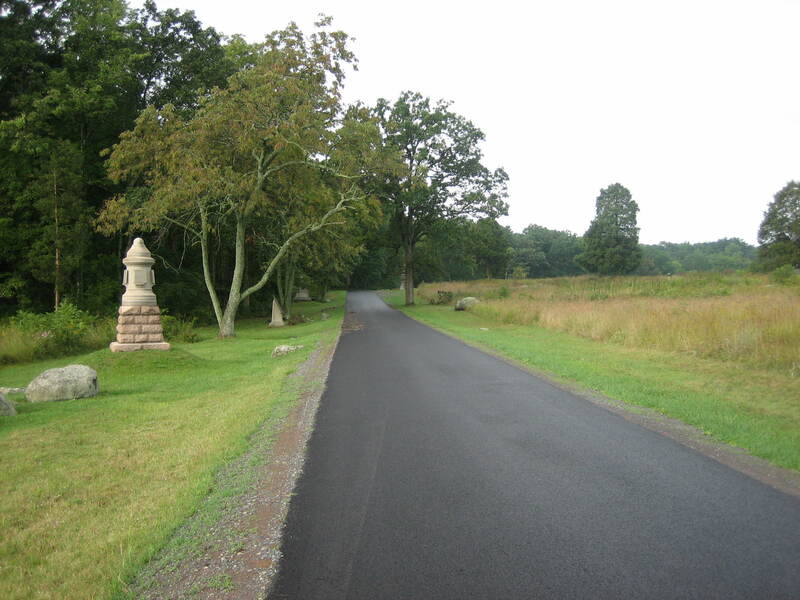 When one drives the Stony Hill or “Loop” on the south end of Gettysburg National Military Park, it is apparent that not only was Sickles Avenue recently resurfaced, the drainage ditches on the road have been covered with asphalt. 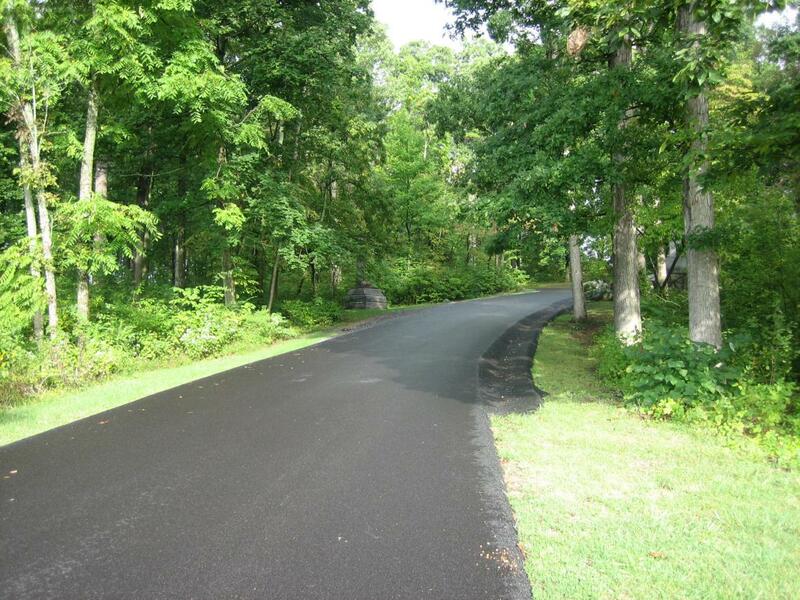 Lots of asphalt. The monument to the 22nd Massachusetts Infantry Regiment is in the left background. This view was taken from the east facing west at approximately 9:00 AM on Saturday, September 13, 2008. 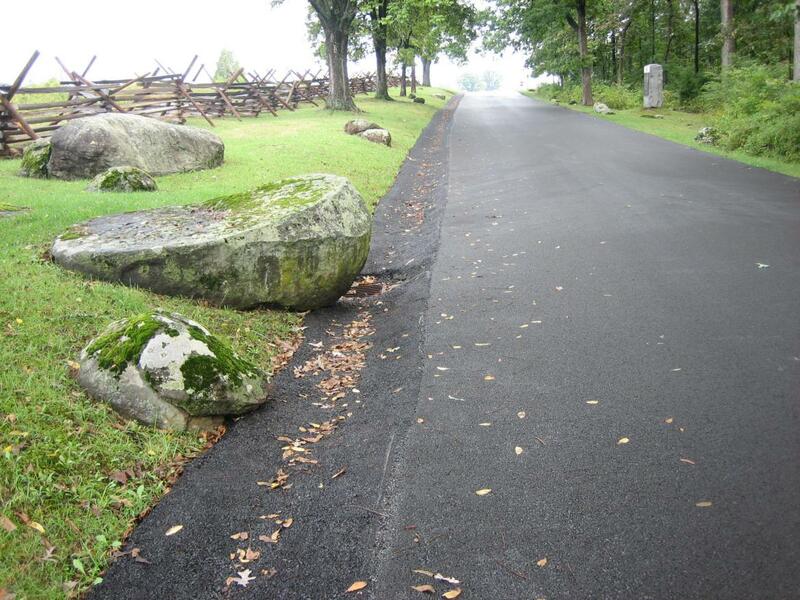 In some areas of the south end of the Gettysburg Battlefield, the road work looks pretty good. 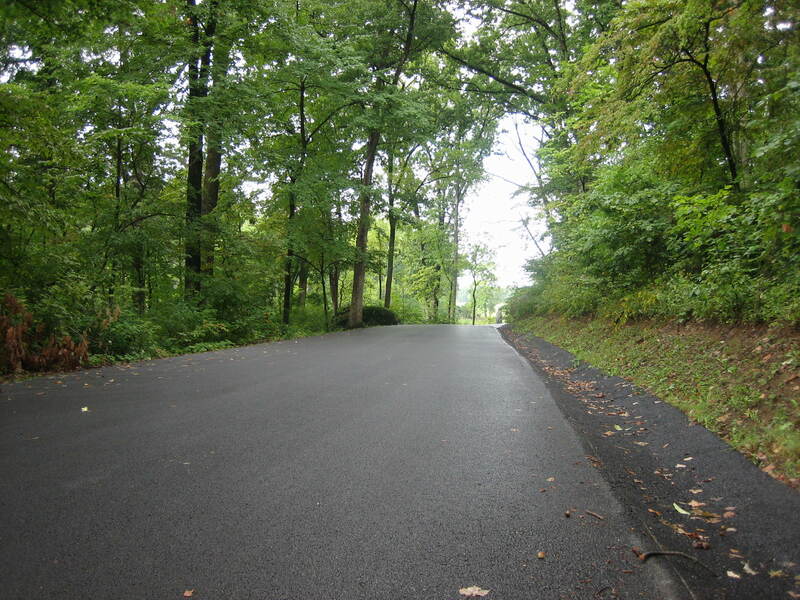 Ayres Avenue, for instance, appears to our untrained eye to have been resurfaced carefully. 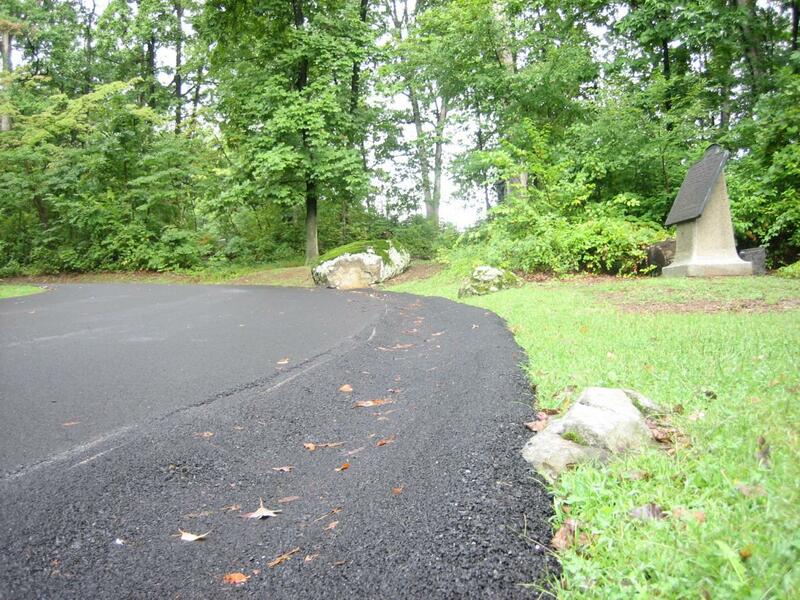 At Devil’s Den and the Stony Hill or “Loop” area, where drainage ditches are needed, the asphalt is in abundance. 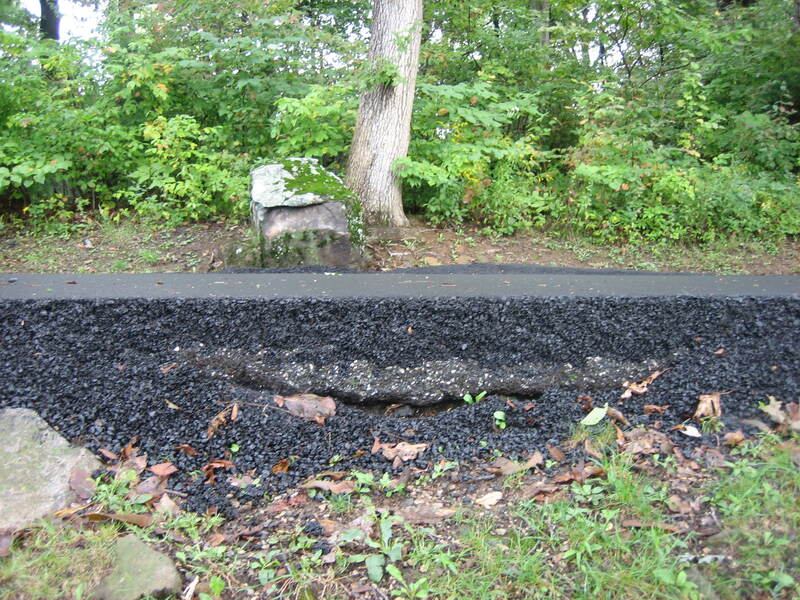 Many of the asphalt drainage ditches are two feet or more in width. Some boulders (witness rocks?) along the road in these areas had the asphalt covering them and/or going around them for no apparent reason. See our follow up post on the Loop on September 22, 2008. See our post on the aftermath of the Devils Den Construction on September 11, 2008. 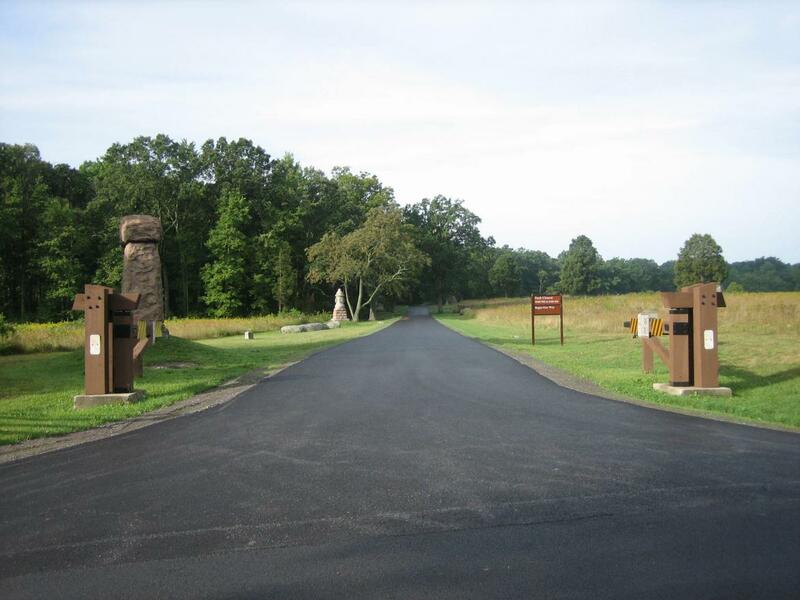 See our posts of the Devil’s Den access closure on August 30, 1863 and August 8, 2008. See our post of the Crawford Avenue and Ayres Avenue closure on August 18, 2008. Of course the drainage ditches are to insure that the road doesn’t wash away. But is this really necessary? This view was taken from the southeast facing northwest at approximately 9:00 AM on Saturday, September 13, 2008. Let’s start our tour of this construction at Ayres Avenue, where it intersects with the Wheatfield Road. This view was taken from the north facing south at approximately 9:00 AM on Saturday, September 13, 2008. To our untrained eyes, this work looks very good. 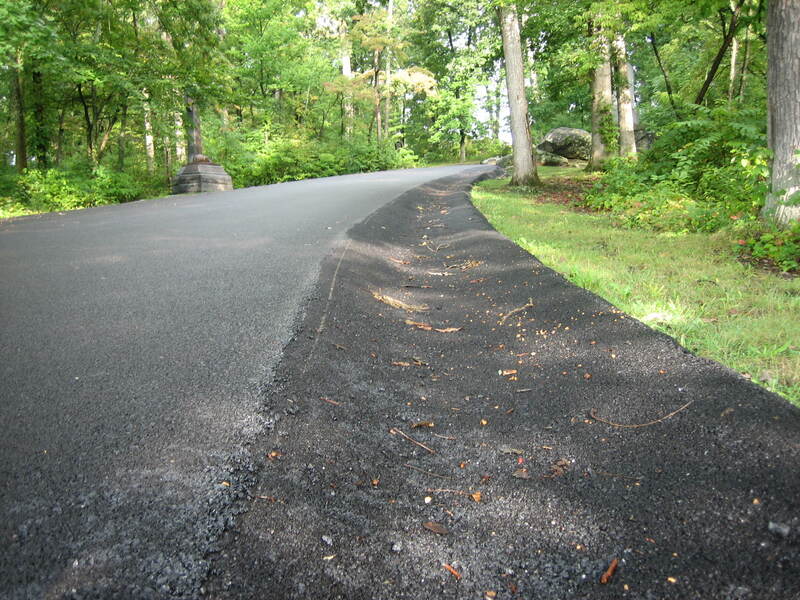 The sides of the road have been built up with crushed stone and dirt so that cars driving off the sides of the road won’t break the asphalt. This view was taken from the north facing south at approximately 9:00 AM on Saturday, September 13, 2008. We’re now driving through the Wheatfield on Sickles Avenue. The parking area on the right looks good. 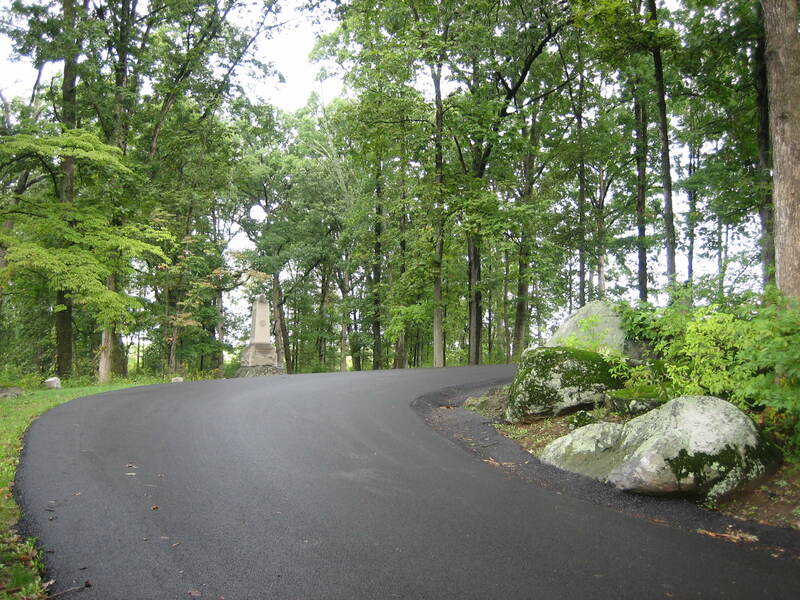 The Stony Hill or “Loop” area is located in the trees in the background. This view was taken from the east facing west at approximately 9:00 AM on Saturday, September 13, 2008. As we begin to enter the woods and go uphill, the drainage ditch appears on the right. This view was taken from the northeast facing southwest at approximately 9:00 AM on Saturday, September 13, 2008. It takes up approximately two feet on the right side of the road. The Irish Brigade Monument is in the left background. This view was taken from the east facing west at approximately 9:00 AM on Saturday, September 13, 2008. As we approach the area of the 5th Michigan Infantry Monument on the right (north) side of the road we see an abundance of asphalt has been used. This view was taken from the east facing west at approximately 9:00 AM on Saturday, September 13, 2008. 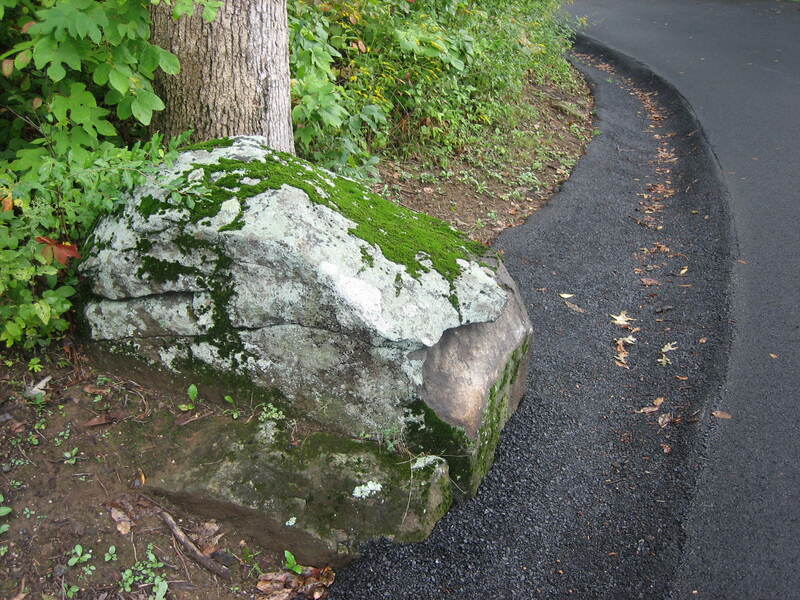 The rocks have the asphalt going on and around them. 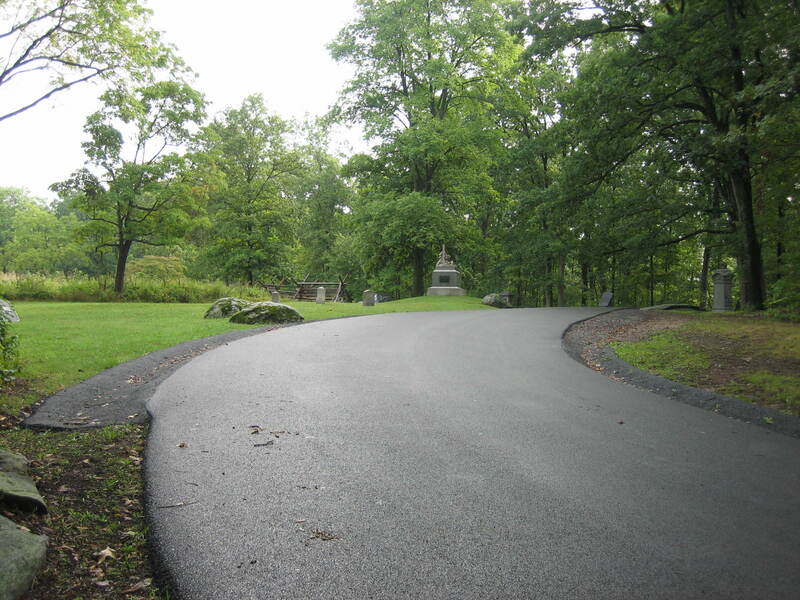 The monument to the 5th Michigan Infantry Regiment is in the center, and the monument to the 66th New York is to its left. This view was taken from the east facing west at approximately 9:00 AM on Saturday, September 13, 2008. Again, how necessary is this? 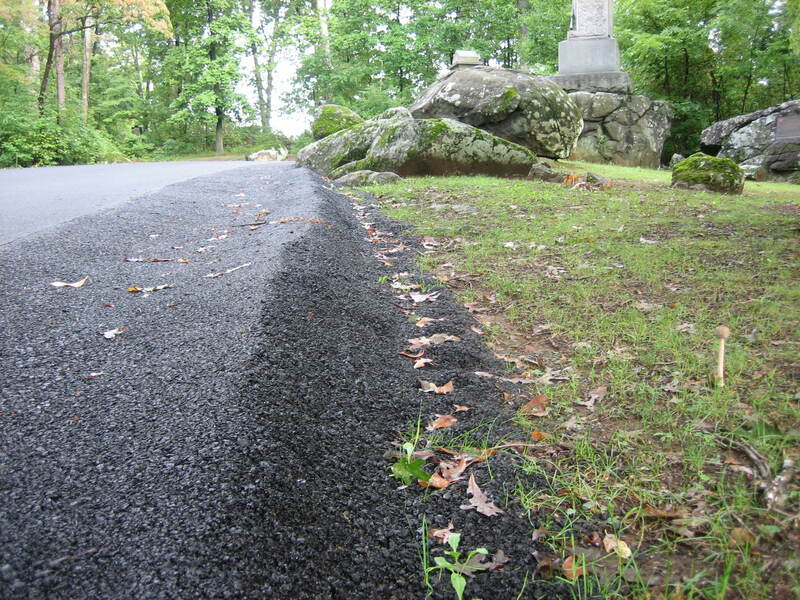 One might argue that asphalt has touched the rocks on previous construction projects, but does that mean that this is an acceptable practice in historic areas? This view was taken from the southeast facing northwest at approximately 9:00 AM on Saturday, September 13, 2008. 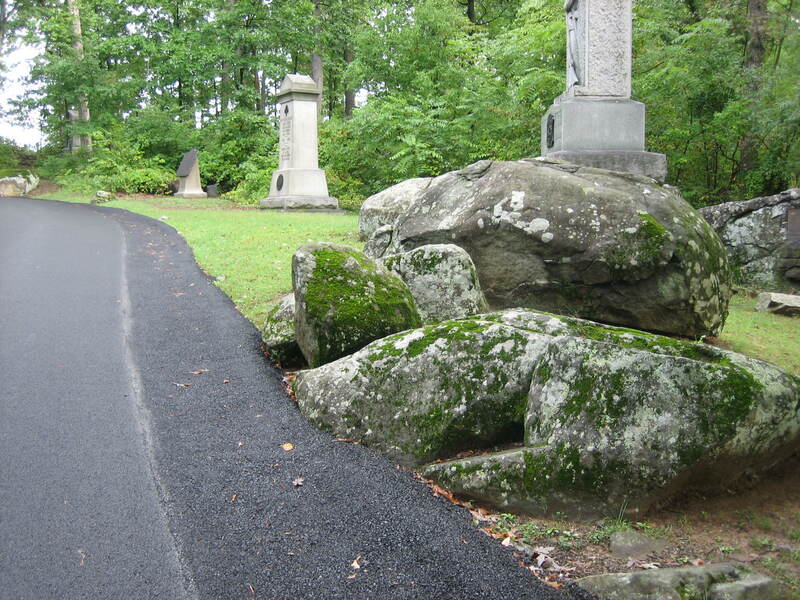 We continue up to the first curve on the Stony Hill towards the next large boulder straight ahead and on the right side of the road. The marker for Zook’s Brigade is on the right. This view was taken from the northeast facing southwest at approximately 9:00 AM on Saturday, September 13, 2008. This we really don’t understand. 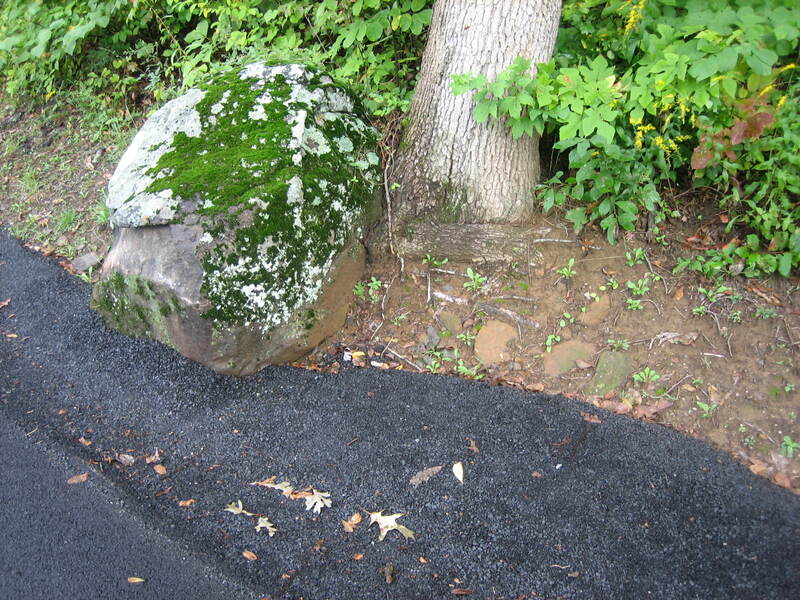 The asphalt touches the rock on the northeast side, and doesn’t need to touch it on the east and southwest sides. 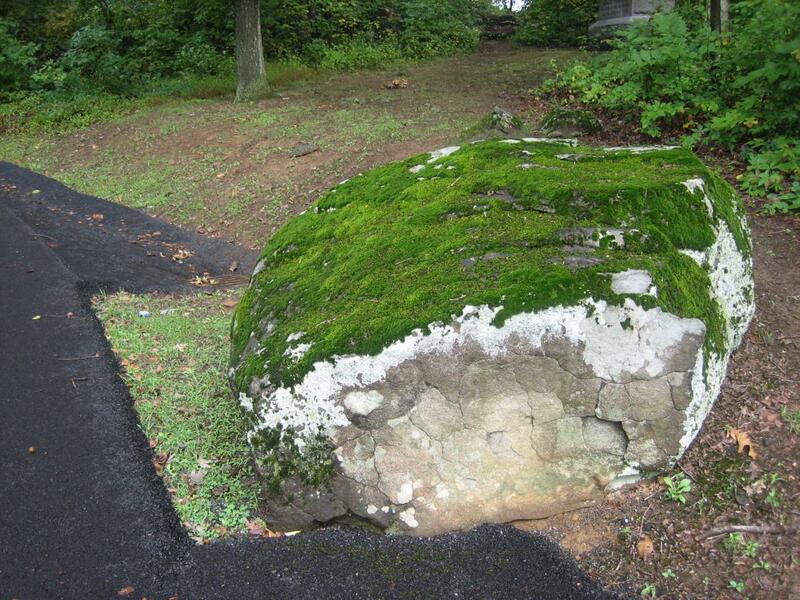 We should probably be grateful that they left the rocks and placed the asphalt around them instead of removing them. This view was taken from the west facing east at approximately 9:00 AM on Saturday, September 13, 2008. Looking back at the same rock and the drain on the west side of the road. This view was taken from the southwest facing northeast at approximately 9:00 AM on Saturday, September 13, 2008. We continue southwest towards the next curve. This view was taken from the northeast facing southwest at approximately 9:00 AM on Saturday, September 13, 2008. This area shows the good and the bad of past and current road construction. 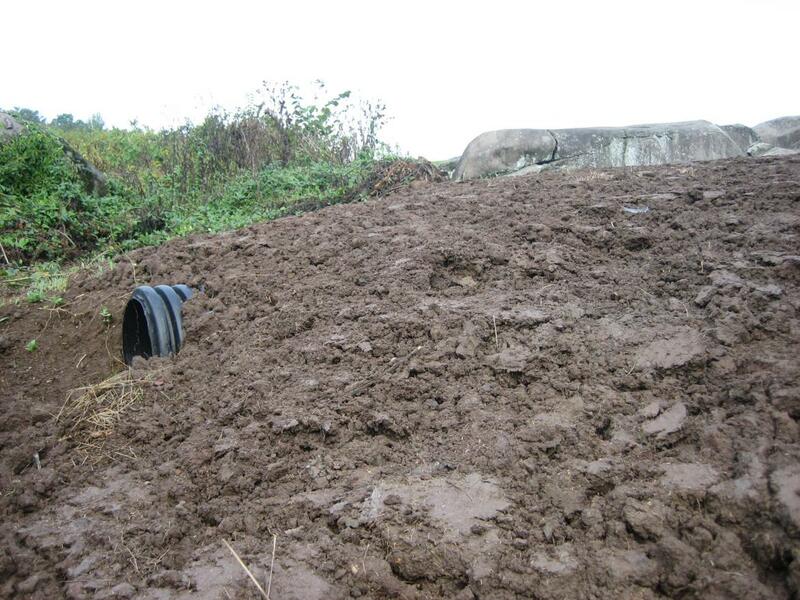 This was an existing drain on the west side of the road. They did not have to dig out the road in this area to make culverts. The monument to the 2nd Andrews Sharpshooters is in the background. This view was taken from the northeast facing southwest at approximately 9:00 AM on Saturday, September 13, 2008. 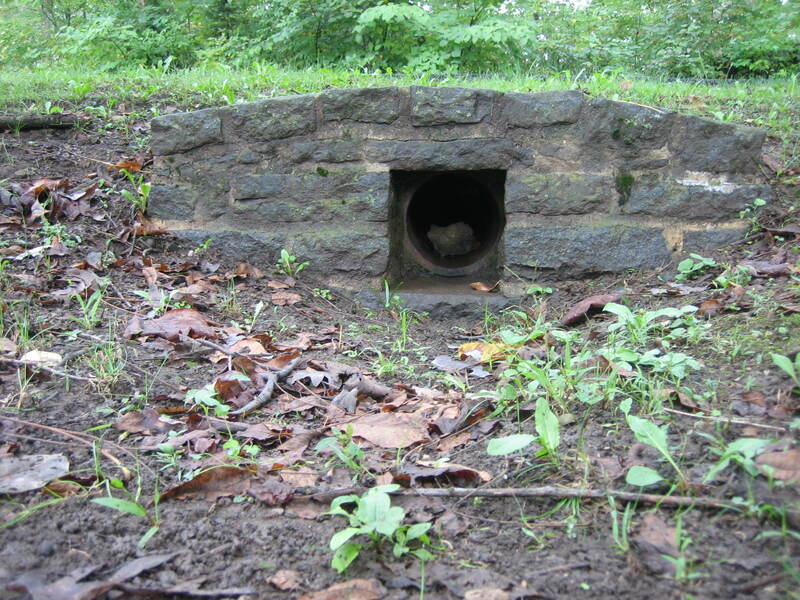 Existing culverts were used on the Stony Hill (Loop) area. This one, on the east side of Sickles Avenue takes water from the drain shown in the previous photograph. Notice the quality stone masonry work of a previous era. This view was taken from the east facing west at approximately 9:00 AM on Saturday, September 13, 2008. 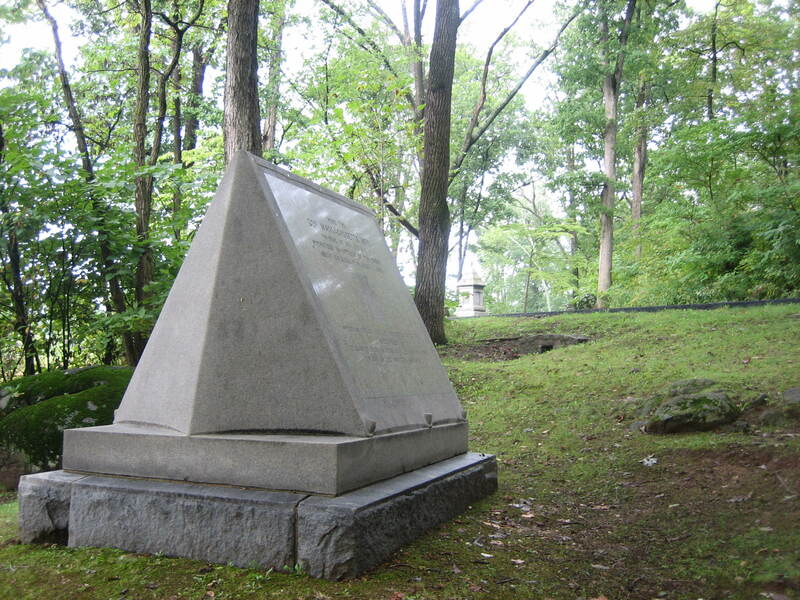 This is the monument to the 32nd Massachusetts Infantry Regiment. 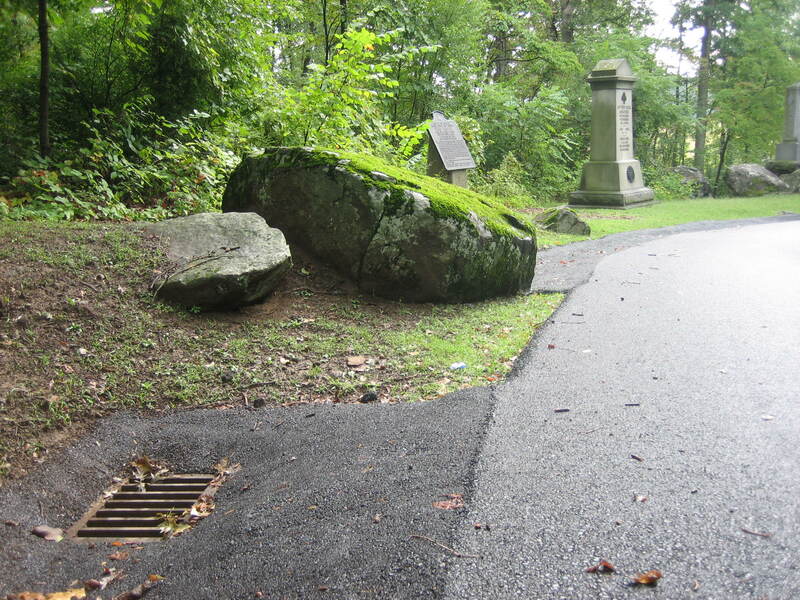 The culvert in the previous photograph is visible just to the right of the monument. 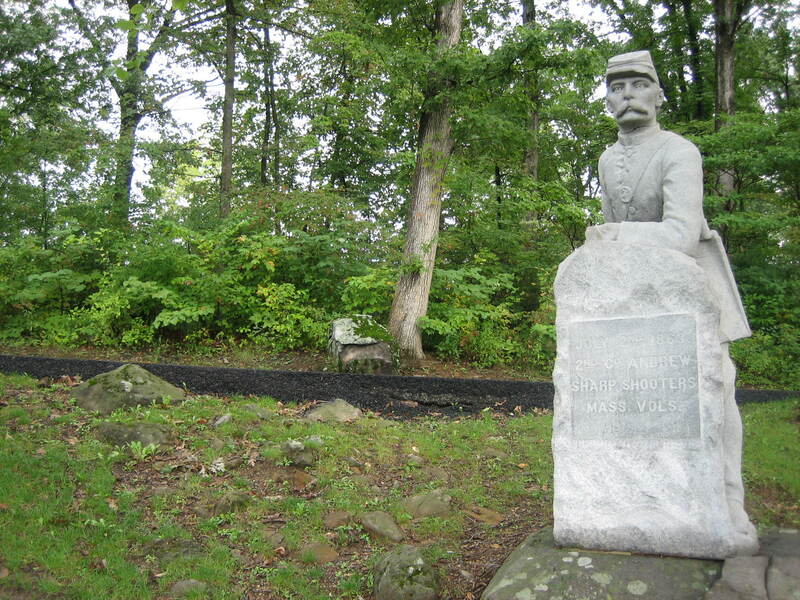 The monument to the 22nd Massachusetts Infantry Regiment is in the center background. This view was taken from the northeast facing southwest at approximately 9:00 AM on Saturday, September 13, 2008. Compare the quality stonework on the culverts from a previous era to the modern culverts, such as this one in the Devil’s Den area. Here we have a plastic pipe sticking out of the dirt. This view was taken from the northeast facing southwest at approximately 9:00 AM on Saturday, September 13, 2008. All is not well as we advance to the last large curve in the loop. The asphalt is not covered with the dirt and rock mix to keep it from breaking away when vehicles tires go off the left side of the road. 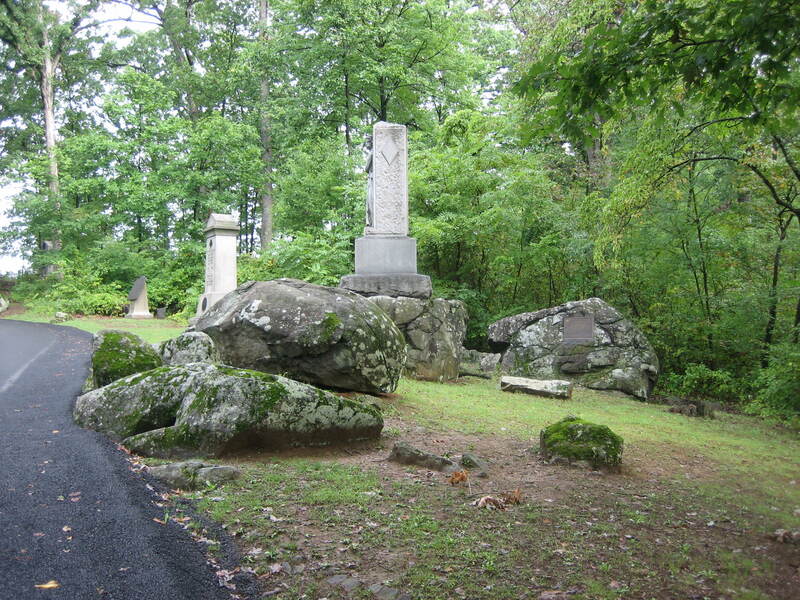 The monument to the 2nd Massachusetts Sharpshooters is on the left, and the monument to the 22nd Massachusetts is on the right. This view was taken from the northeast facing southwest at approximately 9:00 AM on Saturday, September 13, 2008. Notice the crack behind the monument to the 2nd Massachusetts Sharpshooters. This view was taken from the south facing north at approximately 9:00 AM on Saturday, September 13, 2008. 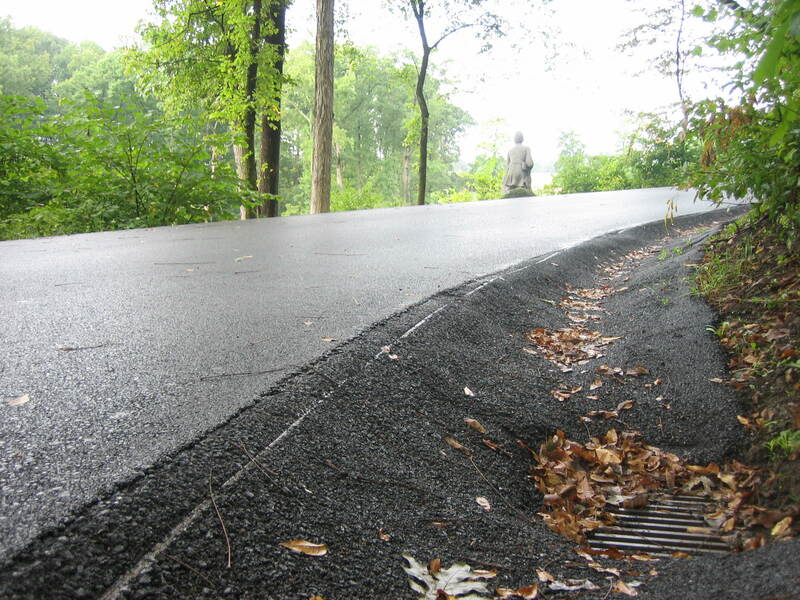 With all the asphalt used, how did they miss this crack? This view was taken from the south facing north at approximately 9:00 AM on Saturday, September 13, 2008. 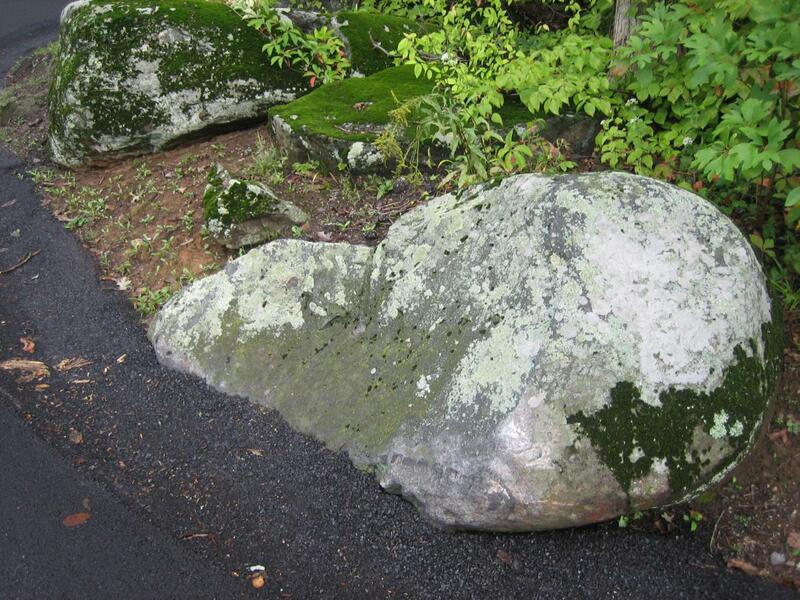 And of course the asphalt in this area has to be drawn to the rocks like a magnet. This view was taken from the southeast facing northwest at approximately 9:00 AM on Saturday, September 13, 2008. This week marks the 50th Anniversary of the debut of the horror/sci-fi classic movie, “The Blob.” In the film, the title creature — a gooey alien that’s emerged from a meteorite — grows to enormous proportions feasting on the bodies of unsuspecting Pennsylvanians. Hmmm. This view was taken from the southwest facing northeast at approximately 9:00 AM on Saturday, September 13, 2008. 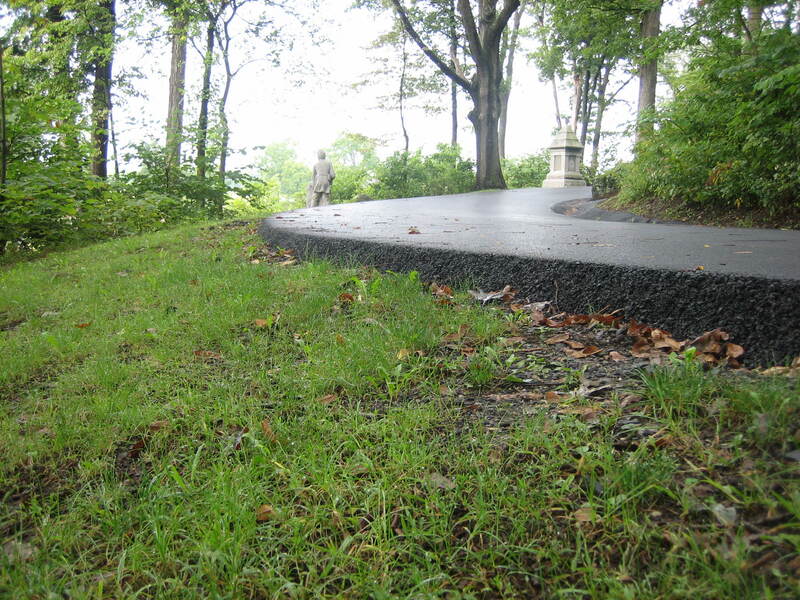 We continue through the Loop to the top of the Stony Hill. The monument to the 1st Michigan Infantry Regiment is in the background. This view was taken from the east facing west at approximately 9:00 AM on Saturday, September 13, 2008. 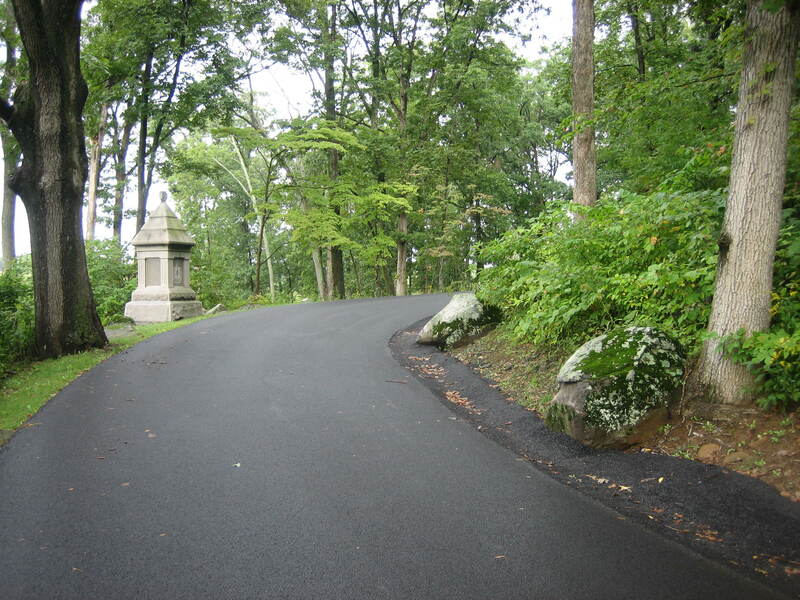 At the top of the hill, the asphalt ditch ends on the right, but begins on the left. The monument to the 116th Pennsylvania Infantry Regiment is in the center background. The monument to the 28th Massachusetts is in the left background. This view was taken from the southwest facing northeast at approximately 9:00 AM on Saturday, September 13, 2008. 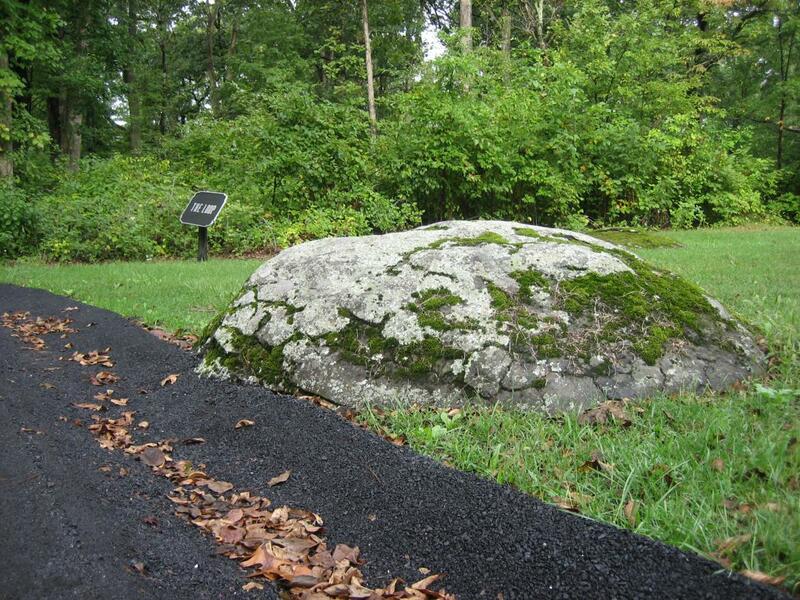 The asphalt covers part of this boulder near the government sign for The Loop. This view was taken from the northeast facing southwest at approximately 9:00 AM on Saturday, September 13, 2008. 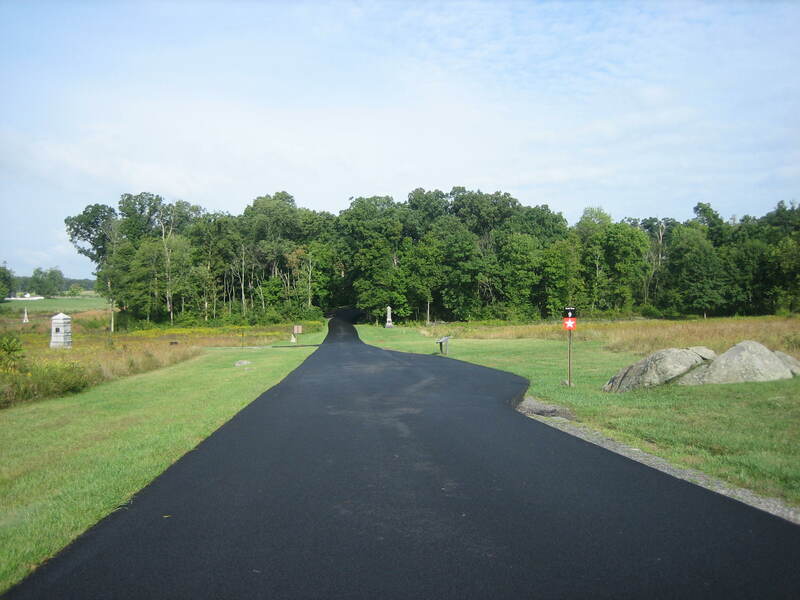 The asphalt ditch continues on the left side of Sickles Avenue as the road continues to its intersection with the Wheatfield Road. This view was taken from the south facing north at approximately 9:00 AM on Saturday, September 13, 2008.